About ten years ago, Melissa Benovic was traveling with her husband, Ilker Arslan, to Istanbul, Turkey, where they visited the Grand Bazaar. It was the first time she had seen a mosaic lamp, and she was in awe of the craftsmanship and beauty of the pieces. She decided to bring one home and was thrilled with the unique light and ambiance it brought to their tiny New York City apartment. Benovic couldn’t stop thinking about the remarkable skill required to make these lamps. 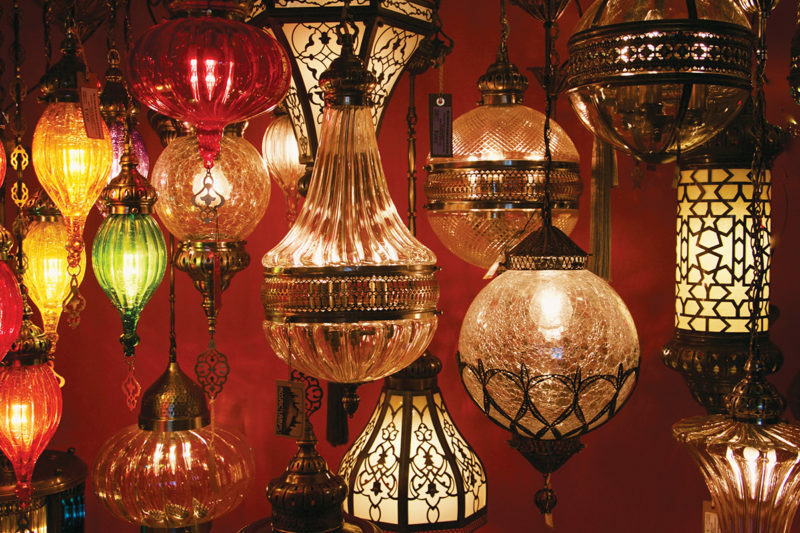 After a conversation with her father-in-law, who sells rugs at the Grand Bazaar, they were able to track down the gentleman who had crafted their lamp. He is the worldwide master in the creation of mosaic lamps, and, over time, they became friends. Melissa and Ilker thought it would be great to offer these exceptional lamps to others, and in 2013 they opened a small lighting store in NYC’s East Village. Benovic grew up in Montague and had visited the Traverse City area many times in her youth. Both she and her husband love what the region has to offer, so in early 2018 they pulled up stakes, made the move to Traverse City, and have just opened a new, larger store on Park Street. Northern Lights carries a large variety of mosaic lighting styles, from chandeliers and table lamps to one of Benovic’s favorite items – what she refers to as a standing chandelier or floor lamp – all in stunning color combinations. The floor lamps offer a brilliant accent for any room and come with five, seven, or nine globes to generate a fascinating glow. Table lamps are their most popular item due to their convenience; just set them down, plug them in, and voilà! – a glowing bit of jewelry for your home. Because the lamps are created by hand, no two are alike, lending credence to the fact that these pieces of art are heirlooms that will be handed down to future generations. Now that they have settled into their new store, Northern Lights has expanded to offer handmade Turkish rugs, one-of-a-kind wooden chairs and ottomans upholstered in kilims, and an array of unisex shoes, boots, and bags – from shoulder-slung wallets to weekenders – also crafted from kilims. They also carry Turkish towels, throws, and robes made from 100 percent cotton. These towels are known for their versatility as the fabric is light, super absorbent, and dries quickly, and they are available in an assortment of vibrant colors. Melissa and Ilker enjoy seeing customers recognize the quality in these incredible one-of-a-kind products and revel in seeing them add a new treasure to their family. I encourage you to stop in and check them out in person to truly appreciate their outstanding quality. Be sure to say hello and let them know you “met” them first in Michigan HOME and Lifestyle.